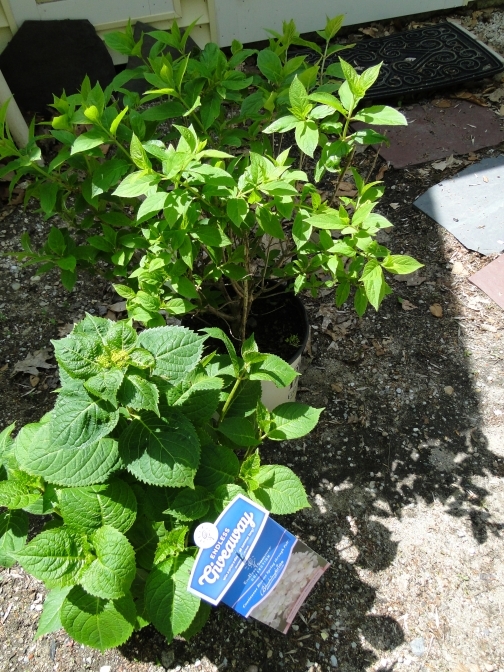 I am very excited to now have my own hydrangeas to plant and grow! It is not only necessary for beautifying my dull and boring landscape, but I need to get photos of the flowers for my business. I’ve had to work with older photos that were taken when I rented a house with hydrangeas in the yard, but now it will be so nice to walk outdoors and snap as many photos as I need. One of the best features of hydrangeas is that the flowers last and last. They also bloom profusely so older flowers and new buds can be on the bush for a long time. If I can get them planted correctly and make them happy I should see some blue, white, pink and green flowers either later this year or next. My Endless Summer plant looks like it may bloom this year and so does the white one (have to get the name), but the Limelight and Pinky Winky may not. Although the Endless Summer tag shows a blue flower, I know that it may not bloom blue unless the soil is right for that. This year I will wait and see what it does.